DURHAM, N.C. Ryan Kelly scored 15 of his 18 points in the decisive first half and No. 2 Duke routed Delaware 88-50 on Saturday. Mason Plumlee added 18 points and 11 rebounds for the Blue Devils (8-0). They never trailed, shot 52 percent, led by 46 and enjoyed a rare breather after a challenging run of games against nationally ranked opponents. Seth Curry, the other scholarship senior on the roster, missed the first game of his career at Duke with an injured ankle. 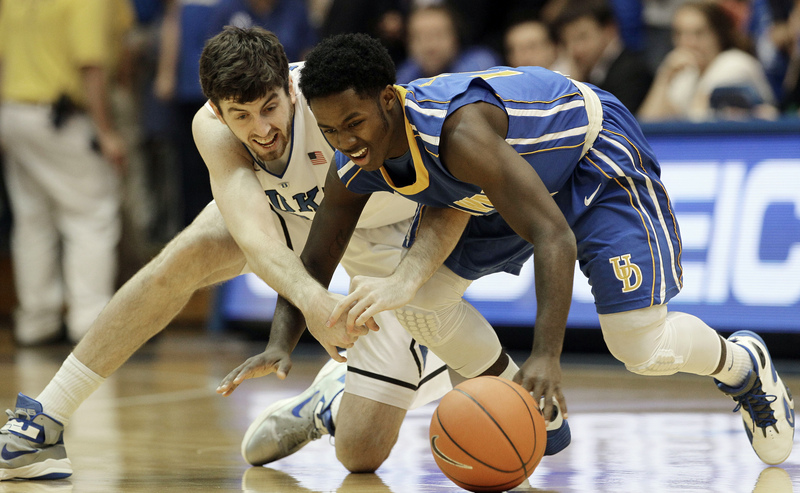 Against the struggling Blue Hens (2-6), the Blue Devils certainly didn't need him. Devon Saddler had 23 points for Delaware, which was beaten soundly by the highest ranked opponent it had ever faced. Rasheed Sulaimon scored 14 points, fellow freshman Amile Jefferson had 12 and redshirt freshman Alex Murphy finished with 10 for the Blue Devils. PEORIA, Ill. - Freshman Nik Stauskas scored 22 points in his first start and Michigan survived a late run to get the win. Stauskas started for Matt Vogrich and had eight first-half points to help the Wolverines (7-0) to a narrow 34-30 lead at the break. Walt Lemon Jr. led Bradley (5-2) on a late run to close to 70-65 in the final minute. But the Braves were forced to foul and the Wolverines held on to win. Trey Burke added 16 points in the Wolverines' first trip to Bradley since 1997. Lemon led Bradley with 15 points. COLUMBUS, Ohio - LaQuinton Ross scored a career-high 22 points to lead cold-shooting Ohio State past Northern Kentucky. Ohio State (5-1) rebounded from a 73-68 loss to No. 2 Duke on Wednesday night in which the Buckeyes led most of the way but faded at the finish. They had another bad shooting game against the Norse (0-5), making only 38 percent of their shots. Deshaun Thomas added 14 points, and Sam Thompson scored 10 for the Buckeyes, who opened an eight-game homestand. Jalen Billups had 11 points for Northern Kentucky (0-5), in its first year in Division I.
Ohio State improved to 72-2 at home against non-conference opponents in coach Thad Matta's nine seasons. LOUISVILLE, Ky. - Russ Smith scored 24 points and Peyton Siva added 20, including four 3-pointers, to lead Louisville to the win. Down three, Illinois State's Tyler Brown airballed a 3-pointer with 8 seconds left that was saved by Bryant Allen to Jackie Carmichael. Carmichael found Brown for another chance at overtime, drawing considerable contact from Louisville's Chane Behanan as the buzzer sounded. But no foul was called and the shot was off, giving Louisville (6-1) the win. Up 67-66 with 43 seconds left, Behanan missed two free throws but made amends on the next defensive possession, pinning a Carmichael shot on the glass and grabbing the rebound. That set up Siva for two free throws for the game's final margin. Illinois State (5-2) led 61-60 with 4:25 to play after being up nearly the entire first half. Brown had 25 points. LEXINGTON, Ky. - Kentucky's 54-game winning streak at Rupp Arena is over. Pierre Jackson scored 17 points and Isaiah Austin and A.J. Walton each added 11 for the Bears (5-2). Brady Heslip and Cory Jefferson each added 10 points and Baylor beat the Wildcats for the first time in eight tries. Baylor shot 41 percent but held Kentucky (4-3) to 30 percent from the floor. Archie Goodwin scored 17 points for Kentucky before fouling out with 1:44 remaining in the game. Alex Poythress added 13 and Nerlens Noel eight for the Wildcats. Kentucky lost its second in a row. The Wildcats lost 64-50 on Thursday night at Notre Dame, their lowest score under coach John Calipari. OMAHA, Neb. - Doug McDermott scored 18 of his 23 points in the first half, helping Creighton to the easy win. Gregory Echenique added 16 points and six rebounds for the Bluejays (7-1), who bounced back after being upset by Boise State on Wednesday. Langston Galloway scored 10 points for the Hawks (4-2), who played their first true road game. Carl Jones, who had 29 points in a win over Creighton last season, was held to nine. The Bluejays played their best half of the season and led 47-20 after breaking the game open with 12- and 13-point runs. EAST LANSING, Mich. - Keith Appling scored 13 points and Michigan State used a big run in the first half to grab control in the victory. Michigan State (6-2) led 10-9 eight minutes into the game before outscoring the Colonels 27-4 during the rest of the opening half. Nicholls State (1-3) was missing three starters because of injuries or illness. Coach J.P. Piper had only eight players to work with. The Spartans' five-game winning streak ended Wednesday with a 67-59 loss at Miami, and they looked a bit lethargic at the start against Nicholls State. They seemed to find their rhythm after the second TV timeout, and seven different players scored as they took a 37-13 lead at the break. CHAPEL HILL, N.C. - Leslie McDonald scored a career-high 24 points in his first career start, powering North Carolina to the win. North Carolina was coming off an ugly loss at No. 1 Indiana, but the Tar Heels regrouped despite playing without starting freshman point guard Marcus Paige due to a shoulder injury. The Tar Heels shot 53 percent and had six players reach double figures, though they had trouble putting away the program led by former UNC assistant coach Jerod Haase. Jordan Swing had 21 points for the Blazers (4-4). BLACKSBURG, Va. - Erick Green scored 28 points and hit eight critical free throws in the final 76 seconds Saturday to help Virginia Tech remain unbeaten. Robert Brown added 18 points and Jarell Eddie had 15 points and 12 rebounds for the Hokies (7-0) and first-year coach James Johnson. Le'Bryan Nash and Marcus Smart scored 18 each to lead the Cowboys (5-1), who lost to the Hokies for the fourth straight time, all in past three seasons. Green played only nine minutes in the first half after drawing two quick fouls, but scored the Hokies' first 10 points of the second half on a pair of 3-pointers, two free throws and a long fadeaway. COLUMBIA, Mo. - Laurence Bowers matched his career high with 23 points despite taking just one shot in the second half, leading Missouri to the victory in its first game since embattled guard Michael Dixon announced he would transfer. Earnest Ross added 13 point and eight rebounds for the Tigers (6-1), who have won 69 in a row at home against non-conference opponents dating to 2005. Jay Canty had a career-high 29 points for Appalachian State (1-6), which has lost six in a row since opening with a victory over NAIA Montreat. Dixon, the Big 12's top sixth man last season, elected to leave the school Thursday after two sexual assault claims against him became public this week. Dixon had been expected to take a major role his senior season but never played. Athletic director Mike Alden declined to comment on the situation. CINCINNATI - Cashmere Wright's fadeaway jumper at the buzzer gave Cincinnati the victory in a matchup of stingy unbeaten teams. In the final seconds, Cincinnati (7-0) was a bit better on defense. Trevor Releford had a chance to give Alabama (6-1) the lead, but Justin Jackson swatted away his driving jump shot. Cincinnati got the rebound and called timeout with 6 seconds left. Wright took the inbound pass at midcourt, drove to the left side of the basket and hit his fadeaway along the baseline over the outstretched arm of 7-foot center Moussa Gueye. JaQuon Parker and Sean Kilpatrick had 13 apiece for Cincinnati. Trevor Lacey led Alabama with 16. MINNEAPOLIS - Rodney Williams had 15 points and eight rebounds to power Minnesota to the win. Austin Hollins added 12 points for the Gophers (8-1), winners of four straight. Trevor Mbakwe and Joe Coleman had 11 points each. Parker Smith led the Ospreys (3-5) with 22 points, but was 6 for 19 from the field, including a 3-for-11 mark from the 3-point line. Travis Wallace added 17. The Gophers blocked a season-high 13 shots, including a career-high four from Hollins and three from Mbakwe. Minnesota also tied a season high with 15 steals. TERRE HAUTE, Ind. - Kendall Williams scored a season-high 24 points to help New Mexico beat Indiana State in overtime. Hugh Greenwood scored eight of his 14 points in OT and Chad Adams added 12 points and 10 rebounds for the Lobos (8-0), who squandered a 19-point lead in the second half, then outscored the Sycamores 13-4 in the extra period. New Mexico won despite shooting 20 percent from the field in the second half. The Lobos outscored the Sycamores 28-18 from the free-throw line. Jake Odum led Indiana State (4-2) with 25 points.